Summary Best Buy exclusive version of popular AC1900 class router with Gigabit Ethernet ports and USB 2.0 / 3.0 storage and printer sharing. 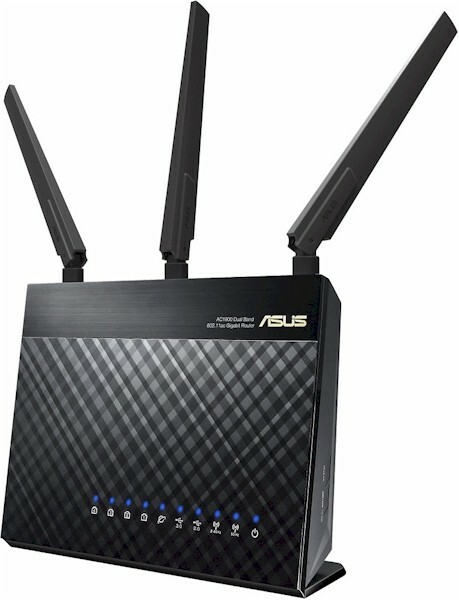 ASUS' RT-AC68 is one of the company's best-selling wireless routers. Part of the reason is it's available in a dizzying array of versions. The table below, compiled by SNBForums member wouterv, attempts to summarize the differences. ASUS also likes to create product versions exclusive to vendors and companies, notably the TM-AC1900 for T-Mobile (not shown above) and the RT-AC68P and RT-AC1900P SKUs exclusive to Best Buy. This is a great marketing strategy because exclusivity (and scarcity) tends to increase router geeks' product lust, even if the difference is nothing more than a model number. In the RT-AC1900P's case, the only obvious difference in marketing literature is reference to its 1.4 GHz dual-core CPU vs. a 1 GHz dual-core CPU on the RT-AC68U. So does this change bring a significant performance difference? We'll see shortly. I'm not to discuss any features in this review, as the ASUSwrt features are well-known. I'll be doing only component analysis and performance review. The components used in the various RT-AC68 versions and now the RT-AC1900P are difficult to parse given all its FCC change filings. And the recent appearance of the RT-AC68UV2 in FCC filings hasn't helped either. This thread discusses the best information the SNBForums community has. So I opened up my test sample after testing for a look-see. Table 1 tells the tale. I can't confirm the clock increase from 1 to 1.4 GHz because the clock device is marked "T250 P qF U", which doesn't equal either number or a multiple. As near as I can tell from the RT-AC68U photo below, its clock device is marked "2.5". Note also the same ESMT memory is used with the only change being -BDB from -ADB on the original. Finally, it's important to note that the radio SoCs remain the same (BCM4360KMLG); the BCM43602 with onboard processor is not used. Here's the RT-AC1900P board with heatsinks and RF can tops removed. Here is a similar view of the original RT-AC68U board. Note the revisions marked on each board. The short gallery below has a few more photos of the RT-AC1900P's innards with commentary. View with the front cover removed. Same view with board removed from case and RF can top removed. There are no components under the heatsink. It's there to cool the transmit power amplifiers on the other side of the board,. Top of board with heatsinks in place. Board top without heatsinks and RF can tops. The original RT-AC68U had relatively poor storage performance thanks to its lack of USB 3.0 connector shielding. ASUS discovered USB 3.0 activity could negatively affect 2.4 GHz radio performance, so added a Reducing USB 3.0 interference setting, which didn't seem to help. The RT-AC1900P has shielding for both USB 2.0 and 3.0 connectors and a more powerful processor than its predecessor. Both could be factors in its much improved throughput for USB 3.0 tests. I also retested the original RT-AC68U (V1 hardware) with just-released 3.0.0.4.380-4164 firmware to see if that made a difference. Table 1 summarizes USB 2.0 performance for the RT-AC1900P, retested RT-AC68U, original RT-AC68U and NETGEAR R7000. Aside from doubling FAT32 write throughput, the RT-AC68U's performance was unchanged. The RT-AC1900P has a slight edge in these tests. But for practical purposes, all three products are about the same. Switching to USB 3.0 results, note that the Reducing USB 3.0 interference setting was disabled for all ASUS tests. Curiously, this setting defaulted to enable in the 3.0.0.4.380_4118 firmware used for testing. This should not have been necessary due to the effectiveness of the RT-AC1900P's USB connector shielding and it unnecessarily and significantly reduces performance. I found this out during my initial USB 3.0 test runs, which produced results comparable to USB 2.0. Table 2 shows the RT-AC1900P as the clear winner, with almost 2x the write performance of the NETGEAR. The RT-AC68U's performance doesn't seem to benefit from the newest firmware except, again, for FAT32 write. The Version 4 router performance tests were run on the RT-AC1900P with 3.0.0.4.380_4118 firmware installed. Table 2 summarizes routing test results; this Excel test summary contains all functional and performance test results. Since the NETGEAR R7000 and ASUS RT-AC68U had previously been retested with the V9 wireless and V4 router test suites, I've also included their results in Table 3. I focus on the simultaneous TCP and UDP results to compare router performance. The AC1900P outperforms the AC68U for TCP traffic, but not for UDP. UDP unidirectional traffic is no great shakes for the AC1900P, either. The gist of the results is that the AC1900P's routing performance is more like the NETGEAR R7000 than the RT-AC68U for TCP performance, but not as good as either for UDP. The AC1900P's functional score of 92.2% ranks it toward the top of this benchmark's chart, representing 19 failing tests out of 245. It passed the triggered port forwarding tests that most routers fail. But it failed to block HTTPS connections with deprecated SSL protocols and ciphers. On the other hand, it failed fewer UPnP related tests than the R7000. The RT-AC1900P was tested with the V9 wireless test proces with 3.0.0.4.380_4118 firmware loaded. Channel 6 and 20 MHz B/W mode was set for 2.4 GHz and Channel 40 and 80 MHz B/W mode was set for 5 GHz. The router was positioned in the test chamber as shown in the photo below. This unusual position was required because the router's normal upright position would have positioned its antennas too high for proper reception by the chamber antennas.I'll be comparing the RT-AC1900P's performance to the NETGEAR R7000 and ASUS RT-AC68U . The Benchmark Summary below shows key wireless benchmarks for the RT-AC1900P and RT-AC68U. The "Profile" benchmarks represent the average of all test values for that benchmark to provide an overall view of comparative performance. The Maximum benchmarks were tested using the Veriwave system, which represents an idealized client. So those benchmarks tend to run higher than you may experience in real-life use. The takeaway here is there isn't significant difference in most benchmarks. The AC1900P's largest improvement is in the 5 GHz Maximum uplink test. Here is the Summary for the NETGEAR R7000. The average 5 GHz profile results are lower than both ASUS'. The 2.4 GHz downlink profile shows similar performance for all three products with the RT-AC68U having a slight advantage at lower attenuation (higher signal) levels, but turning to a disadvantage from 42 dB on. The AC1900P also disconnected earliest. The 2.4 GHz uplink plot again shows an early disconnection for the AC1900P, but higher throughput than the AC68U from the 30 dB test onward. Both ASUS' perform better than the NETGEAR through most of the test range. The 5 GHz downlink plot shows very similar performance for both ASUS routers. Both produce far higher throughput than the NETGEAR in the low attenuation value tests, but converge with the NETGEAR from 30 dB on. The 5 GHz uplink plot again shows both the RT-AC1900P and RT-AC68U with higher throughput than the NETGEAR for most of the test range. The AC1900P has a slight throughput advantage over the AC68U. But I doubt you'd see much of a difference in real world tests. So those of you wondering whether you were missing out on a huge leap in performance by not being able to get your hands on an RT-AC1900P can stop. You're not missing anything other than speedier storage performance if you connect a USB 3.0 drive and are willing to disable the Reducing USB 3.0 interference setting. Nonetheless, the slight differences in results add up to earning an SNB #1 Ranked award. The former #1 AC1900 ranked champ, NETGEAR's R7000 Nighthawk moves down to #2 and the RT-AC68U now ties for #3 with D-Link's no-frills DIR-879.